When Batman began cleaning up the streets of Gotham City he was willing to fight anyone who stood against him and do whatever it took to keep citizens safe. And, honestly, he got off to a really good start. He easily took down the mob, who were only interested in money and power, but how do you fight someone who just wants to watch the world burn? That's the problem Batman faced when The Joker showed up on the scene and changed the rules. The Dark Knight's most famous arch-nemesis loves nothing more than spreading chaos and causing Batman as much pain as he can in the process. Though we hear he also likes gunpowder, gasoline, and can do a really cool magic trick with a pencil! Feel like spreading a little chaos of your own? 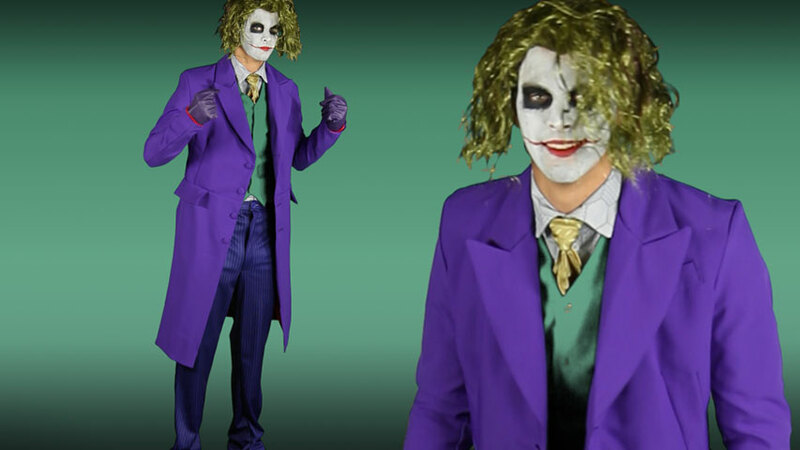 This Grand Heritage Joker Costume will give you everything you will need to put Batman through his paces and whip Gotham into a panic. 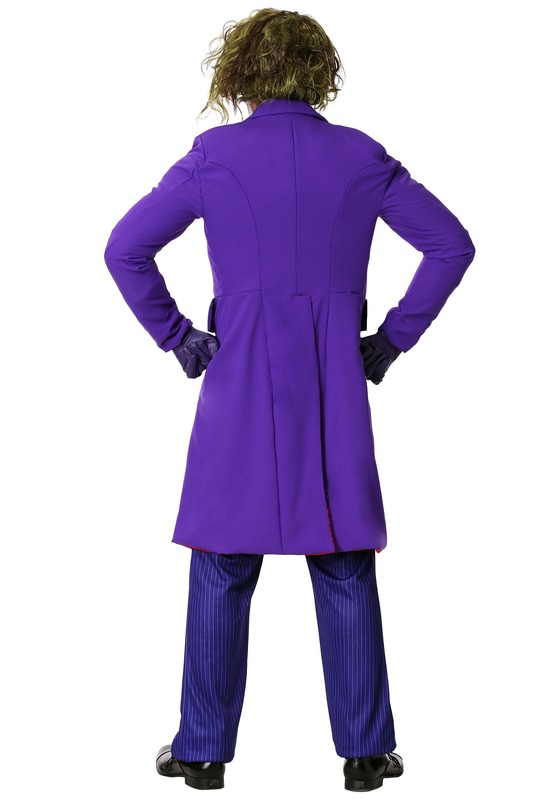 This officially licensed costume includes a long purple jacket, pinstripe-patterned pants, green vest, dress shirt, and tie that have all been designed to capture the details of the outfit worn by The Joker as he terrorized the city in The Dark Knight movie. 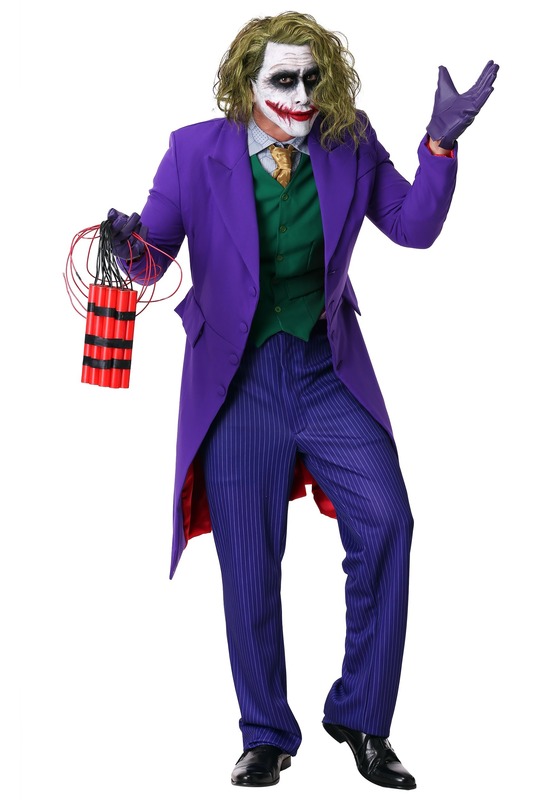 It also includes a green and brown colored wig and makeup set, which comes with prosthetic scars just like the ones The Joker had around his mouth, but you can come up with your own story of where you got those scars. 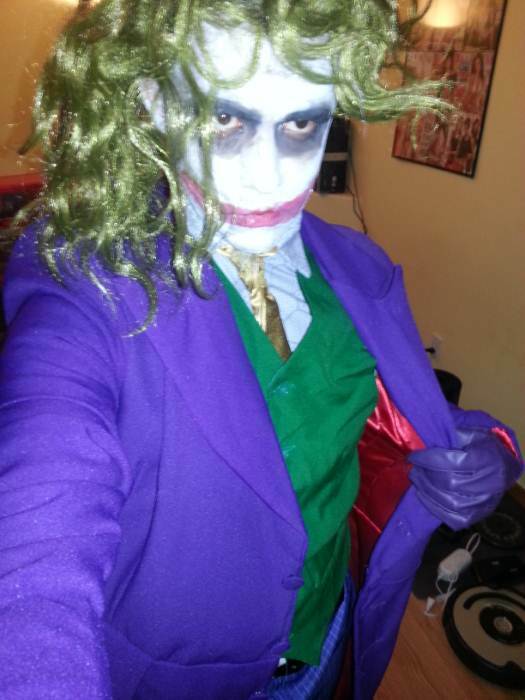 If you haven't started practicing your maniacal laugh yet, then ask yourself: Why so serious? This worked out super well. Fairly good material and combined with the purple tux shoes and socks, it was a winner. I won our work's costume contest. I did have to exchange the 1st order from medium to large. The medium almost fit, but the jacket was too small to fit well. I exchanged for a large and then had the pants taken in and up slightly. Lesson: order a size larger if you're in doubt. The Kit is great over all, guarantee to be a hit no matter the event ! The only thing I wish the kit had was instructions for the make up. Also the pants do not come with belt loops, for me the pants rang a little too big ( I purchased a medium and my waist is a 34) everything else fits perfect. The make up kit brings enough to wear the make up two-three times. 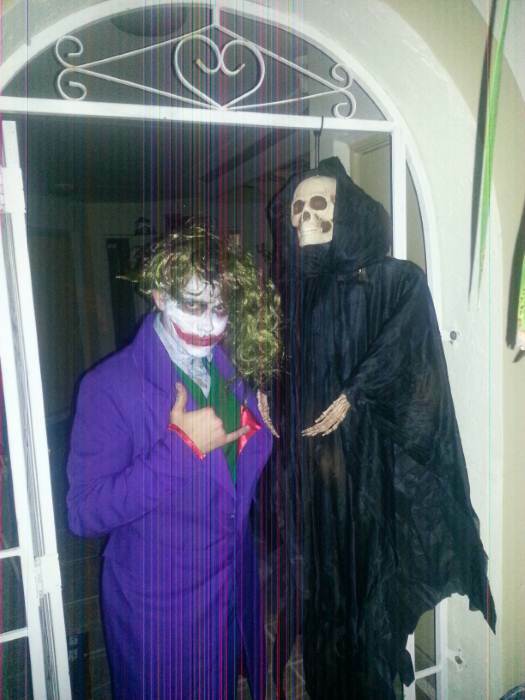 I dressed up twice, once for a party and the other time quickly for the trick-o-treaters. The costume isn't as warm as it looks, I was DJ-ing in the costume in Miami weather and wasn't as hot in other other costumes I've worn. PREPARE to not have significant sized pockets ! - Put on the wig and brush it as needed. Take it off and put it the side. - Wash face really good, put on the costume, tie and all, just do not close the top button of the dress shirt just yet. - Once its all done, tidy up, use the black crayon to give shadow to the red smile. - Close that top button and put on the wig, lick the lips like in the movie ! I love it!!! Great quality!!!! Every one loved our costumes!!! Got a large, gloves were small, but I was able to squeeze into them. Vest was tight and button holes are hard to use on any of the costume, they are too small for the buttons. Overcoat is probably the best part of the costume, pants are way to long and need to be adjusted. Wig is cheaply made, but will work. Makeup kit is below par. First costume they sent was missing %70 percent of outfit, had to wait 2 weeks for replacement, but it at least came with everything second time, Knocking off a star for the shipping problem and 1 star for the quality and fit of the costume. I ordered XL. The pants were WAY too big with no belt loops so you'll have to safety pin or something. The button up shirt that the outfit came with was the only thing that fit just right. The vest and jacket were entirely too small. The makeup kit that came with the costume included jokers scars, which is pretty awesome except that I couldn't use them because the facial adhesive in the pack was so old it was just a solid chunk of white stuff - not pliable or usable at all)= all in all, a very disappointing purchase. The stuff all LOOKED amazing though. Hello! Thank you for your input on the costume and make up. I do apologize if it did not meet your expectations. In looking at your order information, it seems that you did not reach out to us at all in any way for help with any concerns you had about the costume or the make up. The product arrived on time and in excellent condition. With any type of costume they are fitted for the larger vs the average size person so a little tailoring was in order. The costume itself was PERFECT and would be considered a premium product. The costume looked like it came right off of a Hollywood set. I would most definitely order from HalloweenCostumes.com in the future. Actually I am sure that I will order next year's costume from there. My problem was the medium was to large and the small was to small. Another issue was the pants being to loose on the waist. If the pants were set up for a belt, that would be better. And one of the buttons fell off of the jacket. Have to give it 2 stars, I expect more for the price I paid. 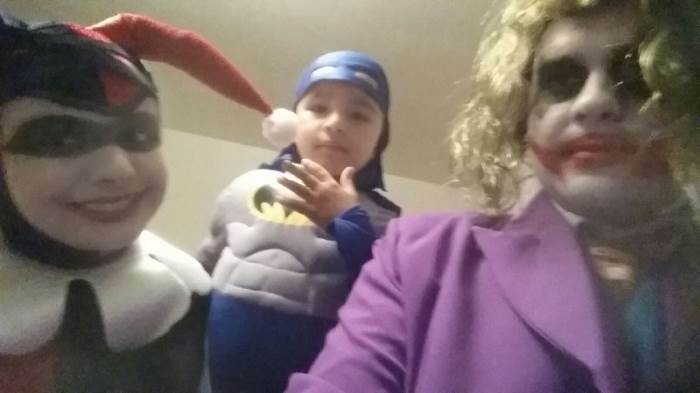 I love this Joker Costume. The only thing i didn't use was the wig I just sprayed my hair green yellow. But the suit is so worth the money. For the price I paid I expected better quality. Had to take scissors to cut the holes for the buttons to fit and clean up all the loose thread. The pockets are all fake and the tie is really loose stitched. I grabbed one thread and one of the buttons fell off the jacket. It's gonna cost me another $50 to fix this to make it half of what is charged. I like the shirt that pattern is very hard to find even though I had the cut the button holes on that too.